Using Fast Fourier Transform, the time domain of the signal is transformed into the frequency domain, i.e. the amplitude (in logarithmic scale) of the audio signal is plotted versus the frequency. Either the sum of the left and right channel of the audio signal can be shown or both channels simultaneously. Roughly speaking, the audio signal of left channel deflects a point horizontally and the right channel vertically (just as the beam of a CRT would do). Thus, an audio signal only present on the left channel produces a horizontal line, whereas an audio signal only present on the right channel produces a vertical line. A mono signal produces a 45 degree line. A stereo signal creates a wilde pattern (if the phase is correct, predominately in the same direction as a mono signal) or may even fill the entire scope. 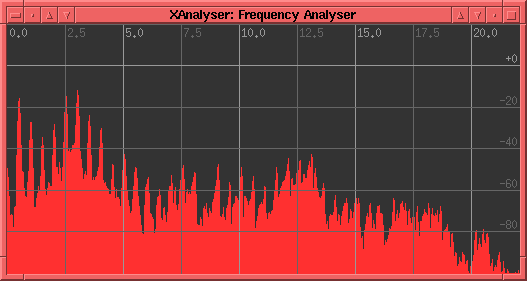 XAnalyser supports the ALSA 1.0 and OSS sound devices. Take a look at a full size image. 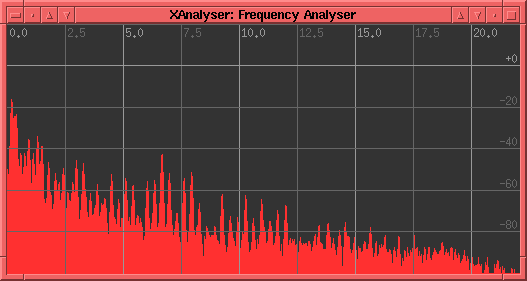 The program xanalyser is distributed under the terms of the GNU General Public License. Note: You will either need Motif, OpenMotif or LessTif to compile xanalyser on your own system. You may also download FFTW, a very fast library for Fast Fourier Transformations which can replace my own slower routines (though the difference is quite small). OpenMotif, LessTif and FFTW are included on openSUSE. The first image shows a sample of the spectrum of the organ at the Ludgeri Church in Norden built in the 17th century by Arp Schnitger. You can clearly see several sharp peaks. Note that the frequencies of these peaks are related to each other. For example, take the peak at 5 kHz. 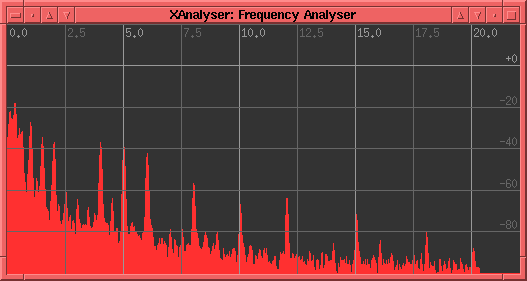 There are more peaks at multiples of 5 kHz, i.e. at 10, 15 and 20 kHz. These frequencies are called harmonics and each musical instrument has a characteristic harmonics intensity pattern. The sample shown here is taken from "Das Goldene Zeitalter der Norddeutschen Orgelkunst - Harald Vogel spielt die Schnitger-Orgel in Norden". Here you can see Jeff Neill's acoustic guitar. There are lots of peaks. This is due to the fact that a guitar has more harmonics and that Jeff plays several strings simultaneously. The example is from "Let It Go" on the album "Flesh And Wood" by Jimmy Barnes. This is the voice of Alanis Morissette. There is a peak every 500 Hz. Here you see the spectrum of an FM stereo station. The modulation goes up to about 15 kHz. The extra tone at 19 kHz is used to synchronise the demodulation of the stereo signal. 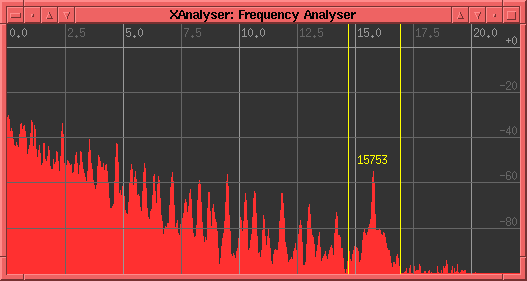 I don't know where this 15.7 kHz tone comes from, but you can see (and hear) it on many recordings. 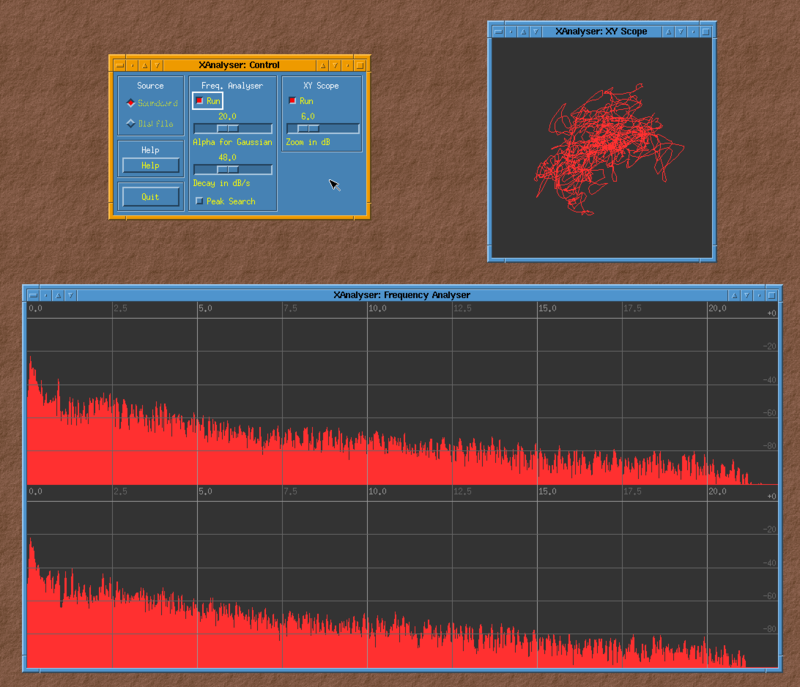 I guess it's the horizontal frequency from some TV equipment. This example was taken from "Last Frontier" on the album "Barnesstorming" by Jimmy Barnes. Seems as if the MTV technicians had this problem while recording "Alanis Morissette - MTV Unplugged". 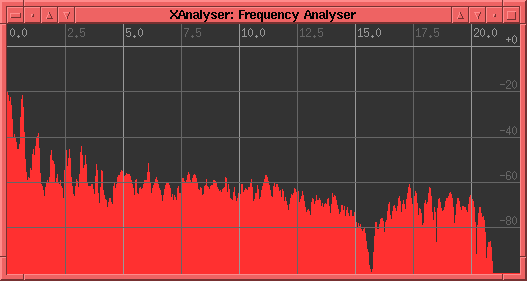 On the last three tracks, they used a filter to get rid of the 15.7 kHz tone, as you can clearly see below. Never mind, it's one of my favourite records of 1999. 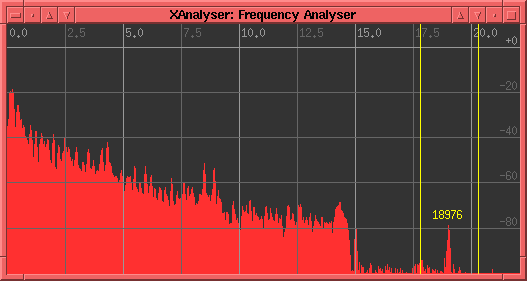 How can I tell xanalyser to use another soundcard? The numbers specify the card number and device number. For more information please consult the ALSA Project. The soundcards should be number sequential starting at 0. How can I change settings permanently? By editing the X resources of xanalyser by either editing the XAnalyser file or by placing parts of it in your .Xresources file. Unfortunately this is altogether not very user-friendly. As a starting point you may consult this article. in your ~/.Xresources file and run the command xrdb ~/.Xresources. The change should take effect the next time you start xanalyser.